In 1858, brothers Charles and Hyppolite Robert founded H. & C. Robert an etablisseur (watchmaking using existing components rather than manufactured from scratch) of pocket watches in Villeret in the Bernese Jura. The company was renamed Robert Frères Villeret in 1885 and began producing their own watch movements and pocket watch cases made of nickel and silver in 1895. By 1908, still owned by the Robert family, Robert Frères Villeret began with the production of chronographs and stopwatches, the ebauche movements of which were gilded in their own workshops. It was in 1929 that the company was renamed Minerva SA, Villeret, which in 1934 was taken over by Charles Haussener and Jacques Pelot. 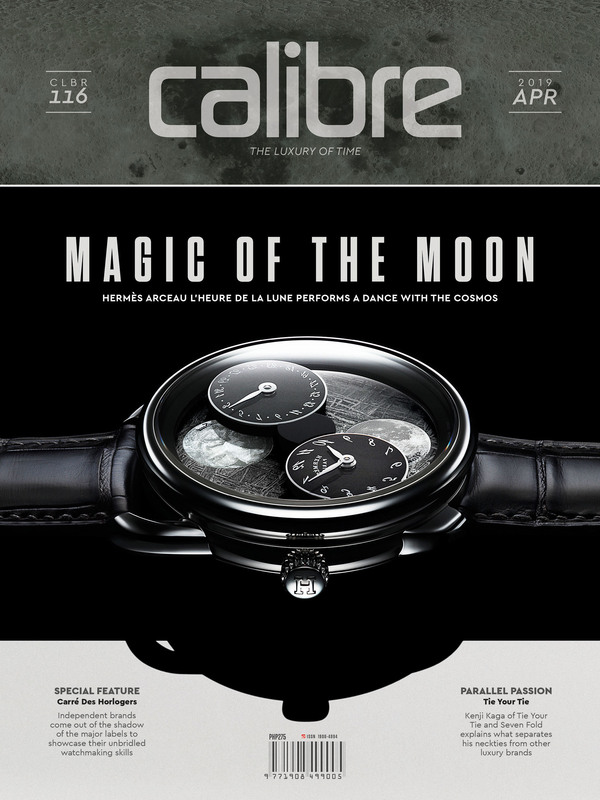 The company’s fascination with recording elapsed time was borne under this new management and led to the production of split-second stopwatches, also known as “rattrapante” chronographs from the French word “to catch up.” As any watch aficionado worth his salt knows, rattrapante chronographs can measure intermediate times without interrupting the ongoing measurement of a longer elapsing interval. 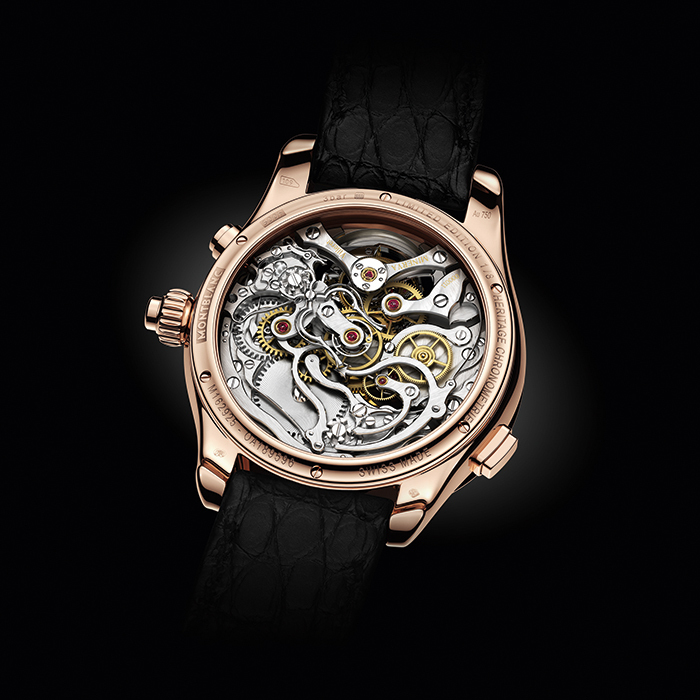 In October 2006, the Swiss luxury goods group Richemont SA bought the Fabrique d’Horlogerie Minerva SA and secured its 148-year old manufacture know-how….ALL of its know-how. Which is why Minerva SA is known today as the Montblanc Manufacture in Villeret, a watchmaker with the same passion for making ground-breaking calibres of the highest craftsmanship and performance. 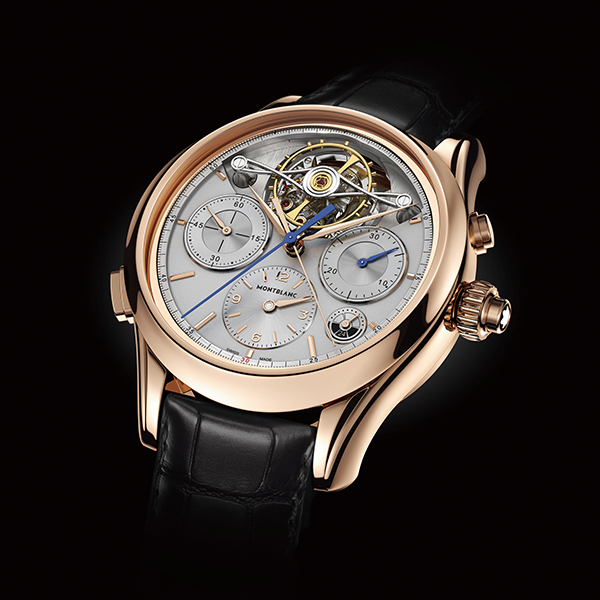 Indeed, this same passion for fine watchmaking and measuring brief intervals of time with utmost precision has led to Montblanc to the 2017 Salon Internationale de la Haute Horlogerie where the Maison is showcasing their new Montblanc Heritage Chronométrie ExoTourbillon Rattrapante Limited Edition 8. A limited edition of only (you guessed it) eight timepieces that combines the Maison’s patented Exo Tourbillon with a monopusher split-second chronograph. Indeed, the ExoTourbillon, which was first introduced in 2010, was developed in the same Minerva workshops in Villeret. “Exo” is from the Greek “external” or “outside” and refers to the screwed balance wheel positioned outside the tourbillon’s rotating cage. This allows for a much smaller cage free of the weight of the balance wheel, which uses only 70 percent of the energy used by a conventional tourbillon. Not to mention, the fact that the balance is positioned outside of the rotating cage also means that it isn’t affected by the inertia of the cage, therefore improving precision. 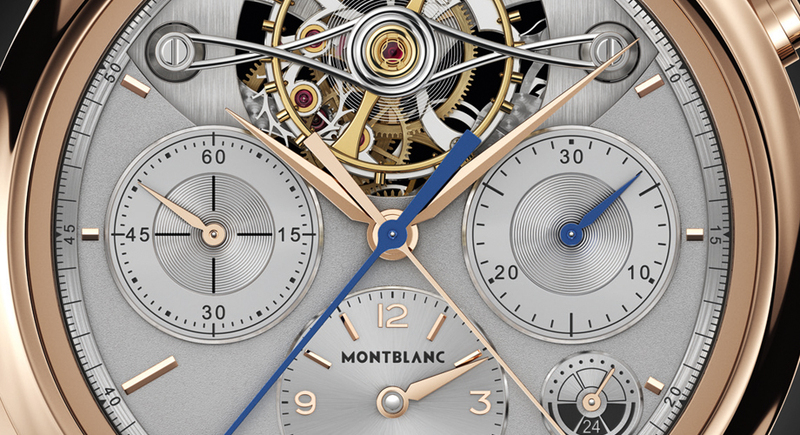 The Montblanc rattrapante complication works with two column wheels and a classic double clamp, which can be observed in motion via the transparent caseback. Once the chronograph complication is activated via the pusher integrated in the crown, both column wheels and the hand-bevelled levers (which are used to transfer the different commands) come into play. Pushing the pusher at 2 o’clock causes thin, delicately curved steel springs to push the rattrapante clamps onto the split-second wheel, enabling the reading of the first measured interval. A second push of the same pusher causes the clamps to decouple so that the split-seconds hand catches up with the elapsed seconds hand and keeps running with it. Finally, pushing on the pusher integrated crown again stops and resets both chronograph and split-second hands. Driving the Montblanc Heritage Chronométrie ExoTourbillon Rattrapante Limited Edition 8 is the manually-wound manufacture calibre MB M16.62, which oscillates at the traditional pace of 18,000 semi-oscillations per hour (or 2.5Hz) thus enabling the measurement of elapsed intervals to the nearest fifth of a second. And, typically, the Montblanc master watchmakers devoted extra care to the delicate components, which are notoriously extremely difficult to fabricate, finish and assemble. Which is why the length of each hairspring is measured by hand, with every hairspring end given an upward Phillips curve. Indeed, no detail was overlooked. The edges of the components are bevelled, the surfaces are brushed, and the flanks bear fine, elongated embellishments. The bright polishing contrasts beautifully with the Côtes de Genève on the bridges, glossy red jewels, and gold-plated wheels. 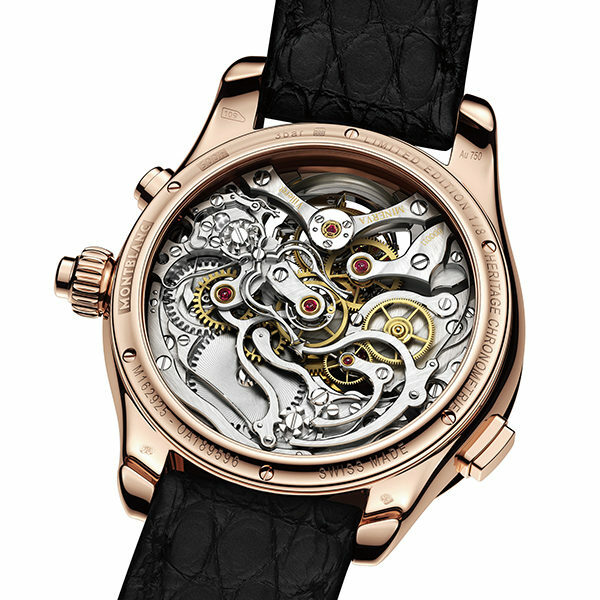 A close look at the 2 o’clock position, in fact, reveals the chronograph’s split-second column-wheel. And in the center of the movement is the artistically-shaped rattrapante-lever, the split-second clamps, as well as their springs. The design of this new limited edition gets its inspiration from a true classic, the Minerva Pythagore timepiece. This 1948 wristwatch may not have been a chronograph but it did feature a precise minute scale and a pure and elegant dial with applied Arabic numerals and indexes. The new Montblanc Heritage Chronométrie ExoTourbillon Rattrapante Limited Edition 8 takes what was beautiful about the Minerva timepiece and makes it into their own. The result isn’t what any watch connoisseur would call a classic but it definitely is an elegant tour de force. The dial, for example, is divided into two levels to create a three-dimensional depth of field. Best of all, it is awash in a number of finishes to enhance that effect. The upper half houses the ExoTourbillon and features a vertical satin finish, while the lower half (which takes up two thirds of the dial) is finished in grey grené to enhance the different counters and subdials. The Exo Tourbillon itself is highlighted by a double infinity tourbillon, a signature feature that takes one week to be hand-bevelled and polished. Further, the raised counters and subdials on the lower half are themselves awash in finishes. 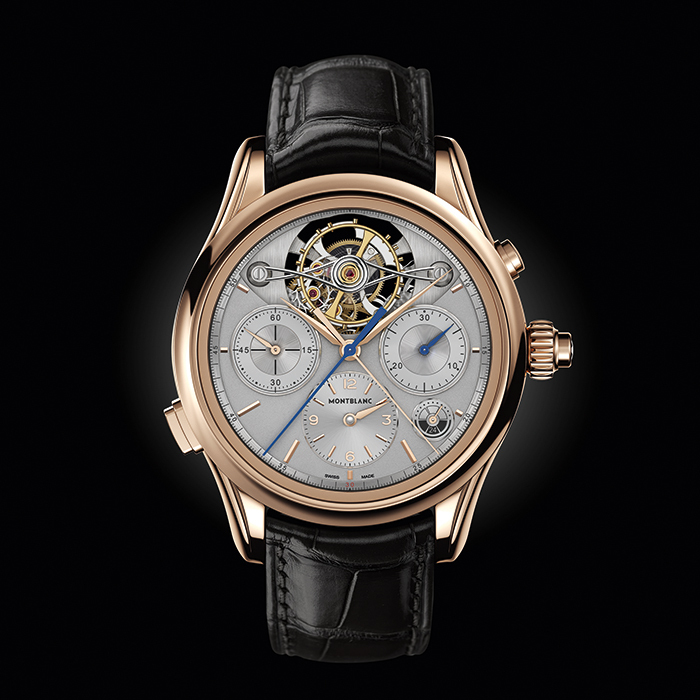 Both the small seconds at 9 o’clock and the 30-minute counter at 3 o’clock feature an azuré motif at their center with an opaline decoration on their external ring. The second time zone at 6 o’clock and day/night subdials, on the other hand, have both been embellished with a sunray pattern. Completing this intricate dial are faceted sword-shaped hands for the hours, minutes, seconds, second time zone and chronograph minutes, baton-shaped hands indicated the day/night and chronograph seconds hands. Applied red gold numerals and indexes add a finishing touch. 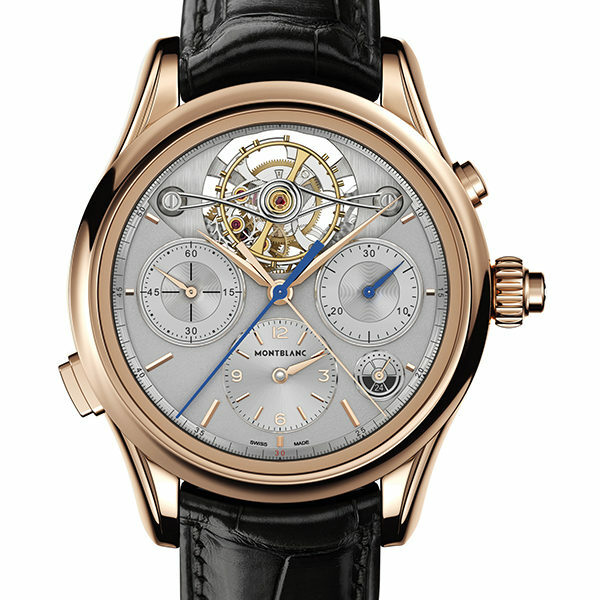 And did we mention the Montblanc Heritage Chronométrie Exo Tourbillon Rattrapante Limited Edition 8 is matched with a high-quality alligator leather strap crafted by the Maison’s own leather manufacture in Florence, Italy? Yes, the Montblanc Pelletteria manufactured the black alligator-skin strap with 18K red gold pin buckle making Montblanc one of only a handful of watch manufactures that equip their models with straps of their own fabrication. And they’re only making eight for this one.